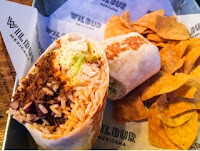 You know Wilbur Mexicana is serving something good from the constant line that forms at its doorway – having passed by the eatery on numerous occasions, I’ve never seen it clear. So, when a casual meal was required, after an event in the King West area, this bustling restaurant came to mind. Part of the growing quick-service industry, the concept is simple: grab a menu, order, sit down anywhere with your sign on display and they’ll bring the food to you. Not realizing that every meal already comes with crispy warm non-greasy tortilla chips, we started with the guacamole and chips ($5), which came shortly after settling down at one of the large communal tables. 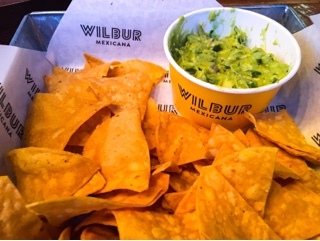 For the price, Wilbur provides a relatively large cup of the rich creamy dip, a simple combination of avocado, cilantro and lime juice. 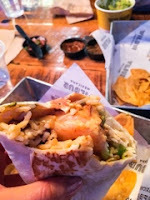 For those who can’t decide between seafood or meat, the S&T burrito ($12) solves your dilemma since it contains both brisket and shrimp. What a hefty burrito, its grilled tortilla brimming with rice, beans, peppers, onions, jalapeno, cheese, sour cream salsa and lettuce. All the ingredients were fresh and delicious: a good portion of the soft shredded beef, the hot shrimp just barely cooked through and even the rice retaining its individual grains and giving off a fragrant aroma. 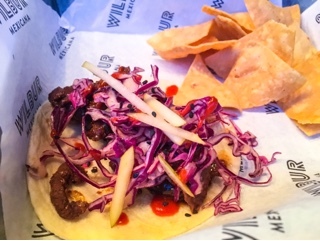 The bulgogi taco ($4.25) was stingy with the beef, although what was on there was well marinated and tasty, but did contain plenty of crunchy red cabbage and pear slaw. Not remembering the taco contained sriracha, the blast of spice was unexpected but contrasted nicely with the otherwise sweeter elements. In a way, it’s such a shame that the burrito and taco were already so flavourful, really not requiring additional salsa or hot sauce, since Wilbur Mexicana has such a great selection of both. 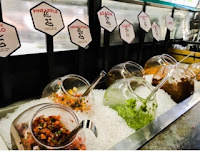 The salsas range from a mild pico de gallo (which was delicious with the chips) or sweet pineapple to more lethal pureed sauces that hide devilish chilies such as ghost peppers. Even the middle-of-the-range asada, made from smoky chipotles, already had enough of the burn quotient for me. 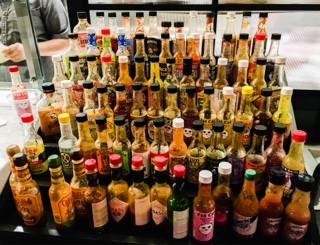 With the jalapeno in the burrito and sriracha in the taco, I didn’t even bother venturing to the hot sauce shelf. 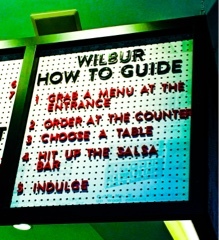 I rather enjoyed the laid back brightly lit environment at Wilbur. 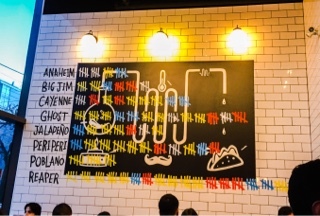 You wouldn’t necessarily go there for a long meal filled with meaningful conversations. But, for a quick bite or a re-fueling while doing a King Street bar crawl, I can’t think of a better place.